I've decided to make a board game. This is something I've wanted to do for a while now, ever since I started seriously playing them, really. I tried my hand at making a card game once. It was all about gold mining in the Yukon and I put it together over the course of about a week. It went okay given what I knew about modern card games at the time, which is to say, next to nothing. I could have kept refining and made it better, but I didn't have the heart or the experience to do much with it. Fast forward three years and now I want to make a board game in my favorite genre of sci-fi space games. Sure, there are a million of them out there already and mine surely won't stand out. But it will be mine. This time I know a lot more about game mechanics and about what I like and don't like in a game. I can make some more informed decisions about what to include and how the game should play and I think I'll have a better understanding of things like player interaction and balance. It will be an area control game. It will have a modular board. It will have a simple dice-based combat system. It will also use a resource allocation mechanism. It will consist of multiple scoring rounds with a larger objective that ends the game. It will be self-published as a print and play game available for a small fee. I will do a limited run of print copies, to be given mostly as gifts, but a few will be for sale. Working title: "These New Worlds"
I plan to document my progress as I go. So here's what I've done so far! 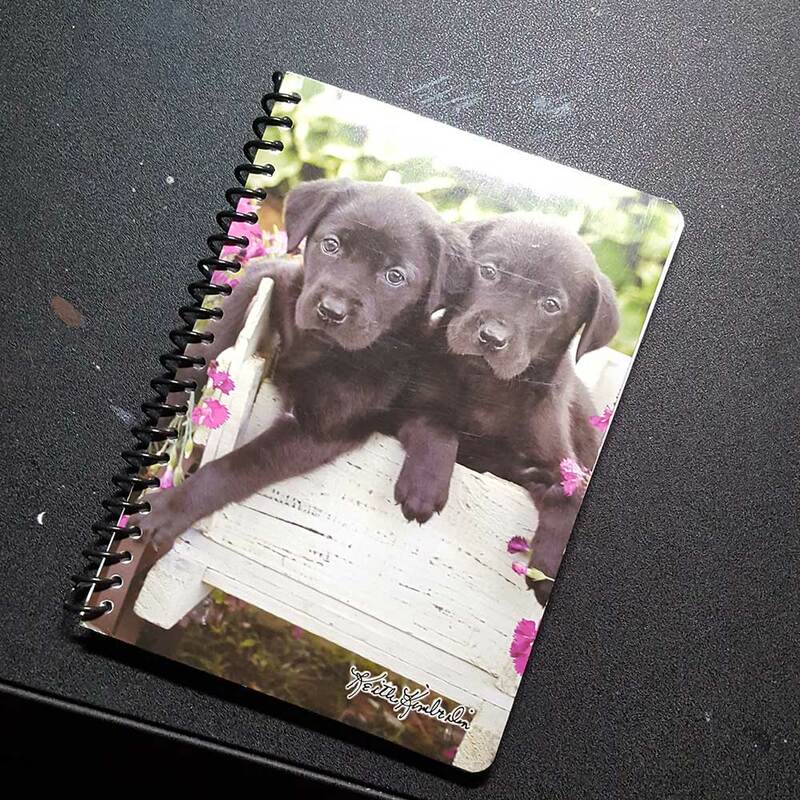 The first thing I did was acquire a new notebook! There are few things I love more than acquiring new notebooks, so this was an early highlight for me. Then I started taking notes... lots of notes. This was 90% of what I did for weeks (90% of what I did on the game - not in general. I do have a job and family). I filled the notebook with everything I could think of; questions about the game that I thought I should figure out answers to, ideas about what I wanted in the game and why, what I didn't want in the game, other games I liked that had similar mechanics, ideas for story and theme, unique mechanisms I thought of that I wanted to refine, how I wanted players to feel when playing the game, etc. 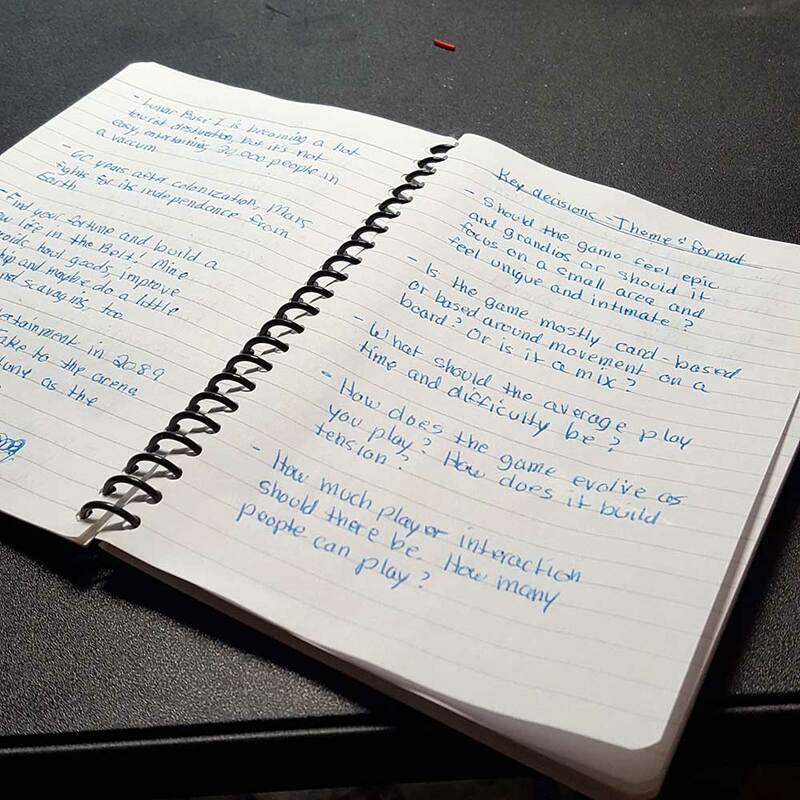 The farther into the notebook I got, the more cohesive the ideas became and it all started to congeal into a real, tangible system with the beginnings of rules and procedures for game play. I began to understand what types of elements I would want to include in the game, what components and cards and board pieces I would need to support those ideas, how randomness would play into things, and what sort of strategies one might use while playing. At this point, I decided I needed to start moving bits around in order to figure out the specifics of game mechanics and how to balance game play. I looked back over my notes and created a master component list of things I would need to have right away. Then I opened up Illustrator and spent a couple of evenings drawing out those pieces as simple line art. 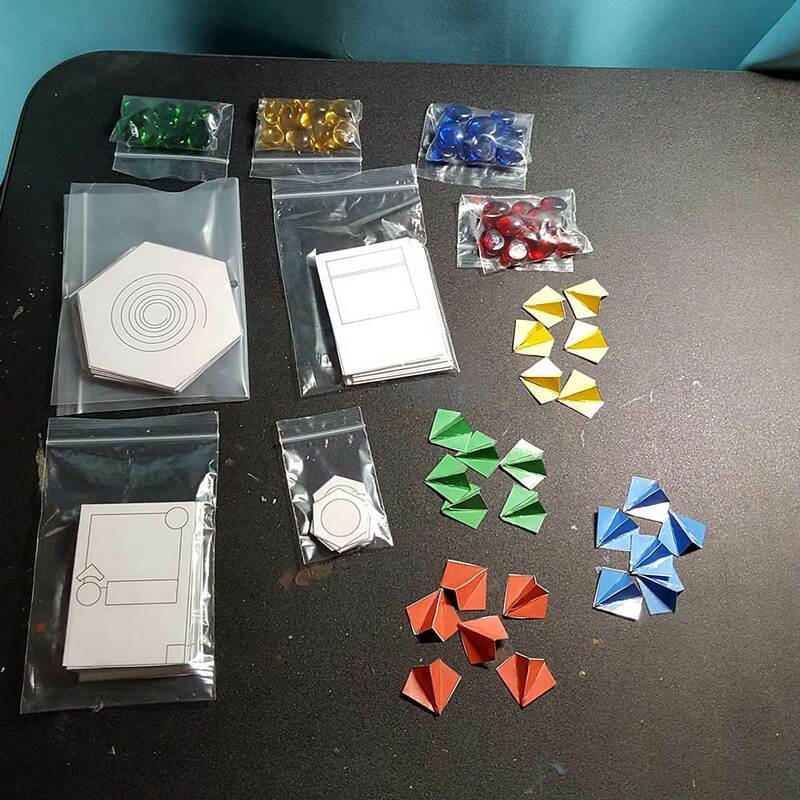 Originally, I'd thought about 3D printing some of the components like game pieces and tokens, but in the end, I decided not to do that yet. These are still very early days yet and everything is likely to change. As much as I love the idea of being able to make 3D prototypes of my designs, I couldn't iterate on it fast enough or cheaply enough at this stage - espeically when you factor in time to paint pieces. I neither have nor wish to buy 4 separate colors of filament. 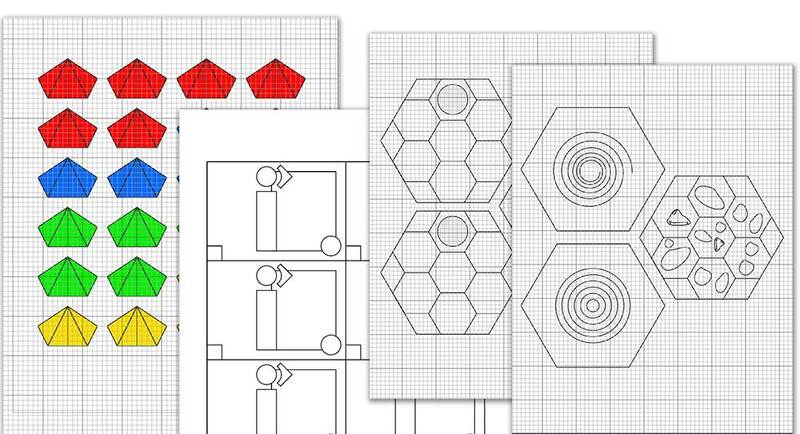 Instead, I designed those little pentagon pieces that could fold into something resembling spaceships. Good enough for now. You'll also notice that I left cards and tiles blank, free of text, stats, etc. Again, this was done in the interest of efficiency. 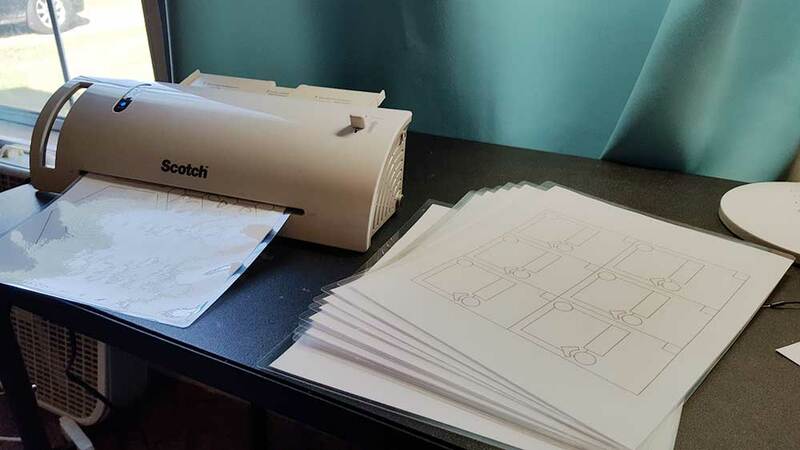 After printing the pieces out, I spent $20 on a laminator and laminated them so that I could write on them with fine-tipped washable markers. This way I can tweak and make adjustments quickly without needing to spend the time or money re-printing things. I think it should make refining mechanics and balancing play a little easier. After laminating 22 pages, all I had to do was cut out 121 individual components. You can quickly see why I don't want to have to keep re-printing. This was super tedious and time-consuming. At first I had everything laid out and I was using a ruler and cutting mat, along with my Sword of Exact Zero, but after about 20 minutes of that, I decided that these rough pre-prototype prototypes didn't need to be that precise and I grabbed a pair of scissors. Even then, it still took a while to cut everything out. By the time I got everything cut out and all of the ships folded, all I had the energy left to do was bag everything up for another day. As you can see, I also added some glass counters to the mix, but that's it for now aside from a couple of dice I forgot to throw into the picture (a d6 and a d8). There will be more components to come later, as well; individual player mats, a round tracker, score tokens, etc. I need to do a little poking at this first to figure out exactly what form those should take, though. So now I'm ready to start scribbling numbers and doing some solo play-throughs based on my bulleted list of rules. I can do math and see what works and what doesn't. If you're interested in play-testing this thing when it's ready, go to the website and join the mailing list. It's early days yet, though, so it will be a while before the game reaches that point. The play-test version will look a lot like the mockups shown above, but with text and stats. Final artwork will come later. Everyone who play-tests will get the final copy of the print-and-play game once it's done.